Home / News / Guess who is the The Creator of Rattanpur ? Guess who is the The Creator of Rattanpur ? After a series of turns in the muddled lanes of Jubilee Hills, there is a dead-ended, muddied road which lead you to old, deserted 'Bhoot Bungalow' with barren land where Pawan Kalyan's Sardaar Gabbar Singh is predominantly shot in a specially erected set - Rattanpur town. The set features an elaborate railway track, an overhead water tank, market including Govindram hair saloon, Dhaba, Kirana shop, Scrap shop, Post office, Library, a group of houses and what not!? Art director Brahma Kadali is the creator of this Rattanpur set. Ever wondered what kinda toil that gets in building huge set like Rattanpur in star-studded film like Sardaar? 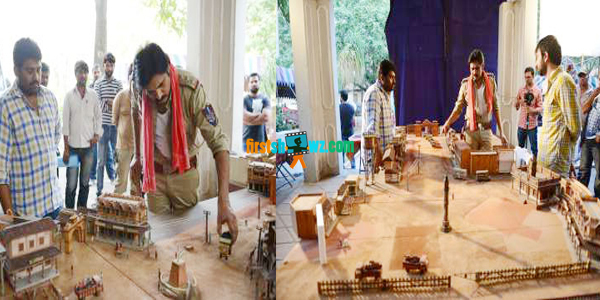 After much deliberation and considering several aspects like how many scenes would be shot, where the scenes begin and from which way characters enter, a miniature of Rattanpur set was made by Brahma Kadali taking inputs from Pawan Kalyan who provided story, screenplay for Sardaar. After making few corrections, the final miniature was made. Once the miniature was ready, the creative team went onto hunt for an ideal location with less greenery so that sky is clearly visible. That's how they finally zeroed in on the land besides Bhoot Bungalow. Once the place is finalized, the miniature is brought to the location and discussed again on how the set looks like. Nearly 350 truckloads of soil was dumped on to the site initially to level the ground. At least 300 to 500 people worked day and night for 45 days to erect the set of Rattanpur which is considered as one of the fastest built sets. Though the art direction team was given a time of 70 days, the team managed to make it in just 45 days. One of the biggest challenges for the art director is to bring total fresh look to the location given that Gabbar Singh was shot earlier in the same location. The total set is built such that Govindram Saloon and Police Station as its centerpiece. From the signal lights to the railway gate to the railway track and goods bogey with supporting platform, each and everything on the set looks absolutely authentic. The platform is built properly to position the goods bogey. With slightly western touch, the set is built keeping the Indian nativity intact. The Rattanpur set costed approximately Rs 5 Crore. SGS is shot in Rattanpur set in around 40 working days. Major portions, including climax and Kalyan's introduction song in the film, are shot in the set.